"Among the candidates believed to be high on Georgia's list of potential replacements are Oklahoma's Jeff Capel; Xavier's Sean Miller; UNLV's Lon Kruger; Baylor's Scott Drew; and Virginia Commonwealth's Anthony Grant." That is almost the exact list I heard today from the same sources that told me about the termination yesterday. The only difference would be adding Jamie Dixon of Pittsburgh much higher, and possibly swapping Mike Anderson of Missouri for Drew at Baylor. It's also very close to the same list I heard several weeks ago if a search were to start. If I were putting together a list, those would be the names, and almost in that exact order. They all have pluses and minuses (which we'll explore later), and most will be tough to get out of their current jobs. BUT...it's not a question of "is Georgia a better job." It's a question of "How big a boy are ya?" It's a question of "Will UGA spend the money to get the type of proven candidate that will move the needle here?" When asked about money during today's press conference, Damon Evans didn't say "money is no object." Which is true, because money is always an object. He said (paraphrase) that he wasn't going to "hold Georgia back" by being cheap on the hire. And that's the right message. Compare that rumored list to the one from the last search when the three big names were Tim Floyd, Lon Kruger (who immediately withdrew his name) and Dennis Felton. Compare it to the rumored list to replace Jirsa which was Mike Brey and Buzz Peterson (Harrick wasn't even on the radar when he was hired by Adams). Basically, I'm saying that if Schlabach is correct. That's one hell of a list. Predictably, various candidates are already jumping to the podium to say they aren't candidates at Alabama and/or Georgia. Tubby was first to say that he's not a candidate at Alabama. He was immediately followed by Mike Anderson. If you deny interest in that job, you're going to deny interest in our job. Neither denial means much at this point in the season. It just means "don't screw up my season by publicly calling me." The AJC's list adds Dayton's coach, Butler's coach and Marquette's coach alongside Mike Davis of UAB. I personally like Davis, and he's better than what we have. However, Dennis Felton is not the measuring stick for the next coach, and we can do better than Davis. They need to look at the upside of our next coach in comparison to Bruce Pearl or Billy Donovan. Not the guy we just fired. I like this list, now lets go get a winner. i like this list, but as an indiana university graduate, you DO NOT want Mike Davis. I like VCU's Grant, and supposedly he was offered the job last year before the magical SEC tournament run. i have confidence that evans will make the right call. I found it interesting that all the coaches listed for the Bama job are black. Davis? What is to like about him? Seriously. Although I bet he would fine the relative anonymity of being the UGA basketball coach to be refreshing after IU. Evans' first major hire, I think. One thing about Richt is that he knows he has to keep Georgia talent in Georgia to be successful. He has done that. The same goes for the new basketball hire. Put a fence around the state and commit to it. If money is no object tear down Steg. Its the 2nd oldest facility in the SEC and it is the 4th smallest and only 23 seats bigger than 3rd. I know they've allocated money to fix it up, but you can't polish a turd. and will pay big time. And the Steg complex aint so damn bad...at least not the part players and recruits see. Dawg19, basketball's not the type to "put a fence around the state". As Paul has said elsewhere, just give me 1 of the top 3, and 2 more of 4-10, and it'd be great. Just routinely get 3 of the top 10, that's a lot better than we've ever been (and I mean EVER), and would be good enough to get the job done. According to this site, mike anderson sounds interested in the bama job. He didnt say no. Hopefully, this officially kills the Bobby Knight to UGA stuff. Matt Chernoff was on the radio talking about how he can see Knight on ESPN the magazine in a UGA sweater sitting next to Uga. Bob Knight would murder some of these kids on the team for their lack of effort. Seriously, he would actually shoot them. Funny how Sam Mitchell's name is nowhere to be found today. I've been to UGA games for 18 years, and I've been inside the arenas at UK, ARK, SC, UT, Vandy, Ole Miss, Auburn, and MSU. All within the past 6 years, and I can tell you that there is absolutely nothing wrong with the inner bowl area of Stegeman Coliseum (i.e. the seating area). That's just a fact. It's not Bud Walton Arena, but it doesn't need to be. When it's full and rocking that cement roof brings the noise down on the crowd like thunder. It's an awesome place to play...when we're good. The problems are entirely the facade, concourses, and restrooms. I need to post the photos / renderings of what it looks like. It's going to be awesome. Georgia is a sleeping giant. But it will take the right coach right now to awaken it. One more failure and this program will never rise above 2nd tier. However, if the right guy comes in and can recruit the talent rich Atlanta area consistently, this program could be primed for very good things. Does Capel have any connection to UGA, or would we just be trying to lure him with big money and the talent rich state? Capel is from the Southeast (Fayetteville, NC). Athens, GA is 900 miles closer to his family than Norman, OK. And yes...money and talent base, too. Damon mentioned wanted a CEO of the basketball program. Sound like any other coach on campus? If DE can pull Capel out of Oklahoma, no one will care what Stegeman looks like. Lets go after Paul Hewitt!!! What about Tom Brennan, the old Vermont coach, not the Fox announcer. He's a UGA grad and is younger than Harrick was when he took the job. Tear down stegman, dismantel the basketball program. Take the money saved and build an indoor practice facility for football on that sight. I think the prospect of a new hire may be the most exciting thing to happen in UGA hoops this year. I swear to God if Bobby Knight is actually hired (which he won't be because Evans is smarter than that), I will stop being supporting my alma mater in basketball until he leaves. The man is a disaster of a human being and is not what I want representing my school. Fortunately he's also over the hill, has been passed by by the game, and won't likely be interested. Mike Davis can stay at UAB, too. He was awful at Indiana both as a human being and as a coach. Why isn't anyone considering Norman Dale? 1. No nonsense attitude. Will kick out malcontents. 2. Proven track record of building programs in disarray into champions. 3. Excellent blue chip recruiter. Jimmy Chitwood ring a bell? I was thinking Clinton Massey might be an under the radar choice. He's well-rounded, not too flashy and has the credentials to be an top tier coach. His defensive schemes are aggressive, but not foolish (like some full-court press all day long approach stuff). His assistants seem to admire him and his techniques as well, not to mention his players. But, I guess our biggest problem has been offense, and with that in mind Chris Brock is also an under the radar pick. He has consistenly had a winning percentage in 7 seasons with a .784, which is pretty good. Plus he's a great PR person, and being from the South, will probably have great rapport with the players and recruits. I go to UNC and watching how far UGA basketball has fallen in such few years is very disturbing. UGA has to go out and get this right this time. You need a good X's and O's guy, but more importantly you need someone that can recruit Georgia. There has been way too much talent leave the state that could have made UGA a top 25 team. The problem I see is that if UGA doesn't find a good hire then I can see them slipping further and further back. Look at the schools in close proximity that recruit the same areas. UF, UNC, Dook, Ga. Tech, WFU, FSU, etc. If they don't find a coach that can bring in one or two of the top guys in Georgia then UGA basketball will be in trouble. Once again.....dropping basketball would require us to leave the SEC. ANd that would probably be a disaster. I have no idea why people keep saying anything about Bobby Knight. It's not 1985 anymore folks. He's 68 years old. He hasn't recruited worth piss in over a decade, and Mike Adams is best buddies with Myles Brand....the guy that fired Knight at IU. You could list 50 people that we'd talk to before we got to Knight. Georgia Sports Blog is an independent site. 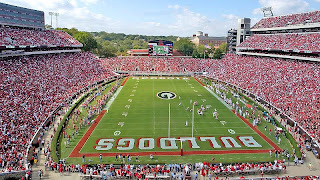 It is not associated with the University of Georgia, the UGA Athletic Department or any other official entity.